Shiryo are the spirits of those who died and did not receive the proper respect after death. From this, they change to become a form of yokai. Long ago in Kashima district in Noto (Modern day Ishikawa prefecture), when the bells sounded on New Year’s Eve to ring in the coming of the new year, the Amamehagi came creeping dowm from the mountains. If they found any children out after dark, the Amamehagi would strip the skin from the children’s feet and wear them as shoes. Needless to say, in those olden times all the children of Noto went to bed early on New Year’s Eve. Long ago, it was said that when a boat put out to sea on New Year’s Eve it was sure to catch the eyes of funa yurei. 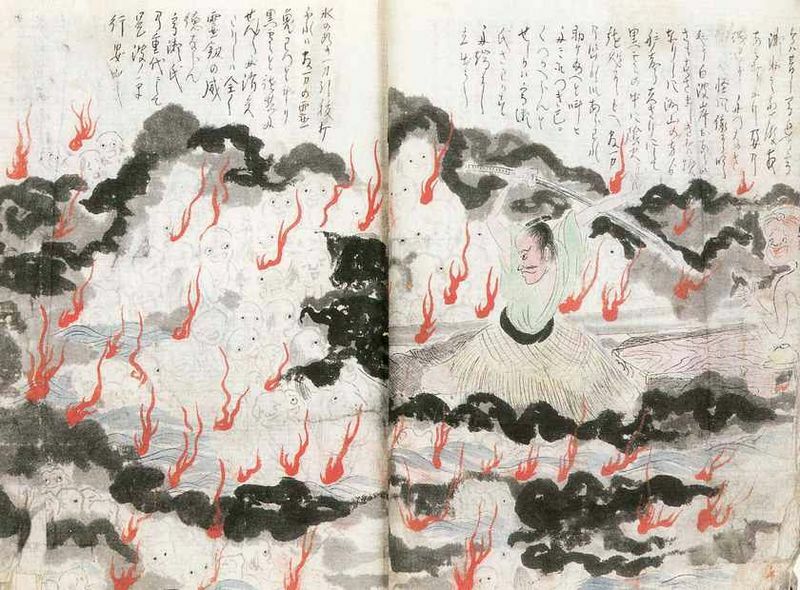 Funa yurei are said to be the souls of drowning victims. Bitter and wrathful towards the living, they rise up from the bottom of the sea to attack boats. One time, at Mizushimanada in the Seto Inland Sea (West of modern day Okayama prefecture) a lone boat crossed the water heavy with goods for the New Year’s festival. Due to the nature of its cargo, the boat had no choice but to cross on New Year’s Eve and was now being tossed about by the white-capped waves. Cheering themselves up in this manner, the boatsmen continued along the pitch-black sea. For a time, everything was good. Their sales were full of wind, and they were traveling so fast it was as if they were flying over the water. But suddenly the skies opened up, and a hammering rain began to fall. The boatsmen didn’t stop their work for evne a moment, and kept the boat steady on as the violence of the rain increased. Suddenly, the boat ground to a halt as if something had moved up behind it and grabbed itl The wind fell to a dead calm. Then, just as suddenly, they were blasted by a fierce breeze that seemed to have come straight from the heart of winter. To the shock of the boatsmen, the boat held its ground, frozen to the spot as if it had set down roots. From deep under the water, something was drifting up towards the boat. It looked almost like floating balls of cotton. The white shapes moved relentlessly upwards, increasing in size as they approached. The boatsmen could see them now; wrapped in kimonos as white as snow, their hair floated wildly in the water. From below there was a ghastly light illuminating their faces. 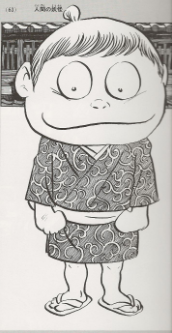 There was no doubt these were the dreaded funa yurei. Their ghostly hands stretched up from the waves, and their voices carried their bitter grudge toward the living. It is known that, if you should find yourself in such a situation and overcome by fear you actually had over the hishaku spoon they are requesting, then you are as good as dead. Before your eyes, the single hishaku spoon will split into multiple spoons, and arms beyond you ability to count will stretch out from the ocean. 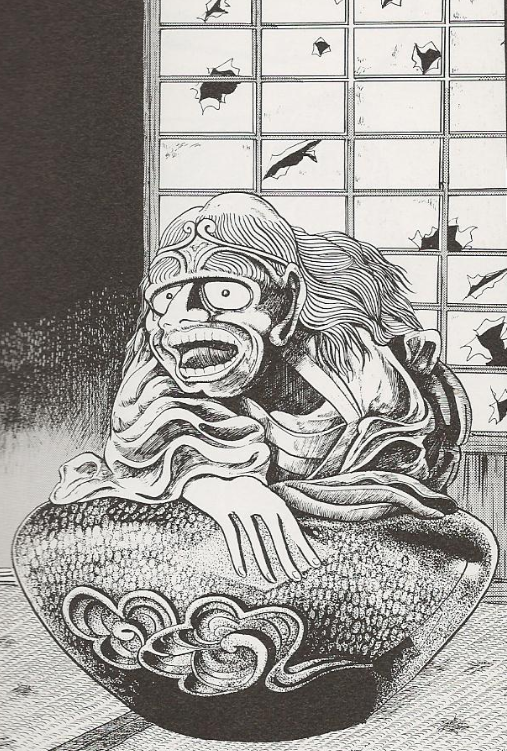 Singing their loathsome song with voices filled with hate, the funa yurei will ladle water from their infinite spoons until you boat is swamped. And if this is not enough to sink your boat, they will reach up and drag it to the bottom of the ocean. How many hundred of ships have been sunk in this manner? But these boatsmen, shivering so badly they could barely hold their oars, refused absolutely and pulled the water with all their strength. This did not discourage the funa yurei. Slowly the boat moved slowly forward in the water, followed closely by the funa yurei. 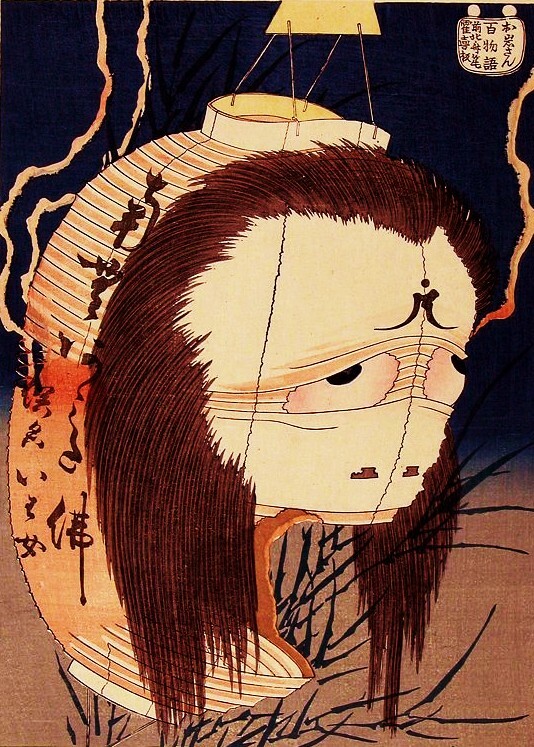 The boatmen took their oars and began to beat with all their might on the heads of the funa yurei. A funa yurei grabbed hold of one of the oars and pulled with such strength that one of the boatmen was dragged into the ocean. Letting go of the oar, he clambered up the side of the boat upsetting the lantern they had used to guide their way through the black night. 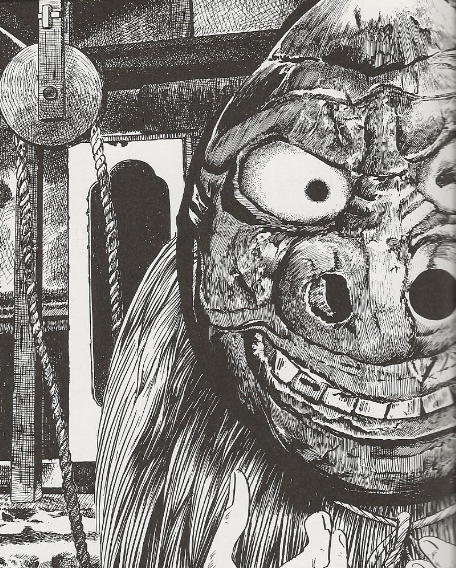 Sparks flew off of the lantern, and the funa yurei fled before the power of the flame. With that, the boat that had been held almost still in the water suddenly broke free and sped along smoothly. The boatmen pulled with all of their remaining strength for the shore. The funa yurei are found not only in the Seto Inland Sea, but anywhere in the waters surrounding Japan. Always they ask for the hishaku spoon. Because of this, some boats carry a specially prepared hishaku spoon with holes drilled in it. This way, when the pass over the spoon the funa yurei are unable to fill the boat with water and they can make their escape. This legend comes from Okayama prefecture, from an Edo period book called “Kasshi Yawa.” A fishing villiage in this area still sells specially made hishaku spoons with holes that are said to ward off the funa yurei. Long ago, in a village deep in the mountains, there was a large hexagonal rock. The rock was cut in two diagonally, starting from the top. It looked exactly as if it had been cut by a sword. Everyone in the village called it the yurei rock. The reason behind this name is the story to follow. When we say “long ago,” in this instance we mean about a hundred years ago. At that time, the monk at the village temple would gather the young men of the village together after dusk to teach them reading and writing. One night, as he always did, Kage went home from the lessons alone. It was a lonely village road. The path home took Kage by the village cemetery. Illuminated by the moonlight, Kage saw a beautiful young woman in an elegant kimono making mysterious gestures before the graves. Kage stopped in his tracks, and stared at the young woman. She didn’t seem to notice Kage, and with a flick of her wrist threw a small stone into a hole that she had dug near a grave. What she was doing was an old style of prayer, where you dug a small hole in the dirt and flung in a small stone. If it was done well and with true intention, it was said that your prayer would succeed. Kage has been standing and watching this the whole time. He watched until the very end then silently slipped away. But the next night when walking home, he saw the young woman perform the same ceremony, and she did it again the next night, and the next night again. Kage wondered about the mystery, and decided to ask the young woman what she was doing. “Yes. That was my prayer. And now it has come true. Come this way. There are many things I wish to talk to you about. With that said, the young woman stood up and walked into the darkness. Kage was intrigued by the mysterious beauty, and so he followed her. As the young woman walked in front of him, Kage noticed that she glowed with a pale light. Just as he said that, the young woman turned to face him. She was still beautiful, but her face was pale, drained of all color, she stared at him with glowing eyes. Overcome with fear, Kage drew his sword from his sheath and in a panic screamed loudly and slashed blindly at the young woman. In the darkness, the sound of the slashing sword rent the air. After slicing wildly with his sword, Kage returned to his senses and fled home without looking back. The next day, Kage snuck back to the cemetary where he had met the young woman. But instead of her slashed body, as has he had feared, he found nothing. Instead, he saw the hexagonal rock that had always been there, only now it had been cleaved as if by a slashing sword. From that time, more than a hundred years have passed. But the villages never forgot the story of the yurei rock. But there was once a rich man who was building a magnificent garden. He found what he felt was the perfect rock to place in his garden, but when he tried to move the rock, it split in two. He summoned a local stone cutter, who used his skills to put the rock back together, where it was placed in the garden. The rich man went and enjoyed his garden every day. But one evening a young woman who was a servant in his household came rushing up to him, her face pale. She was shaking with fear. It was then that the rich man remembered that he had found that perfect stone in a cemetery. Without delay, the rich man had the rock returned to the cemetery. He then had the local temple monk hold services for the lingering spirit. This is a folktale from Fukushima prefecture. At sometime the yurei became connected to that rock. There is a similar story in Gifu prefecture as well.